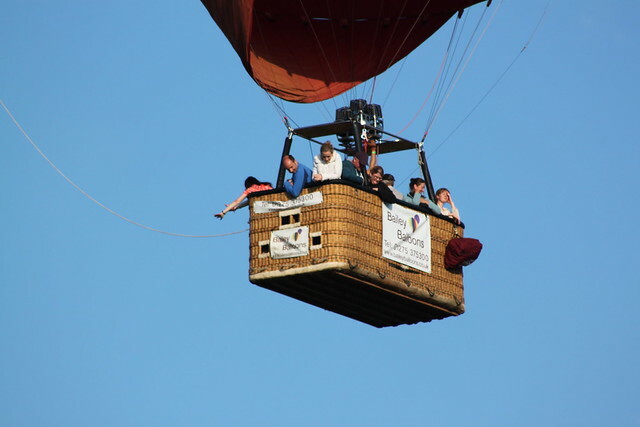 I was awoken at seven o’clock last Friday morning by my wife’s insistence that she could hear a balloon. Now, I know that I don’t always function particularly well first thing in the morning, but I challenge anyone to describe what a balloon sounds like. I thought at first that it might be some kind of Zen koan. But then it struck me that this weekend is the Bristol Balloon Fiesta and things started to make a bit more sense. 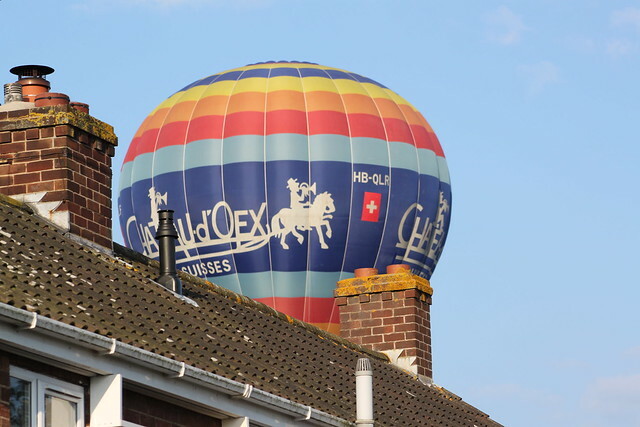 A quick glance out of the bedroom window confirmed that there was, indeed, a huge hot air balloon floating past at an alarmingly low level, its burner roaring as the pilot attempted to avoid the chimney pots and telegraph poles along our street. See what I mean in the photo below. 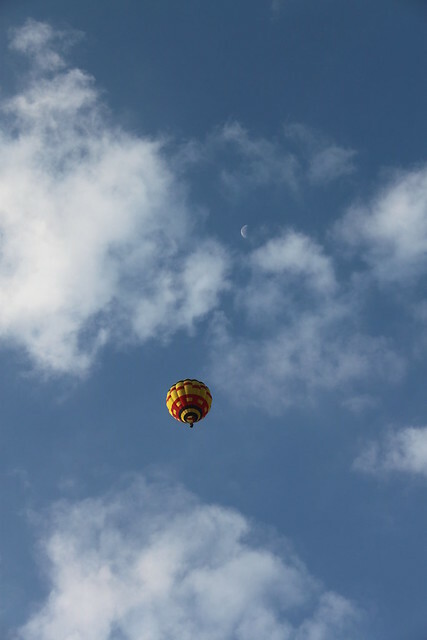 It turned out that the balloon that had woken us was a bit ahead of the rest of the pack, which was heading towards us from the launch site to the north east. They made a brilliant sight as they emerged out of the sun, even if the photo below doesn’t really do them justice. I figured that we still had a few minutes before the rest of the balloons got to us, so I dashed in to feed the dog and to get us each a cup of tea. When I got back, things were definitely starting to happen. I was beginning to wish, though, that I’d put some jeans on over my jim-jams – or at least a dressing gown. 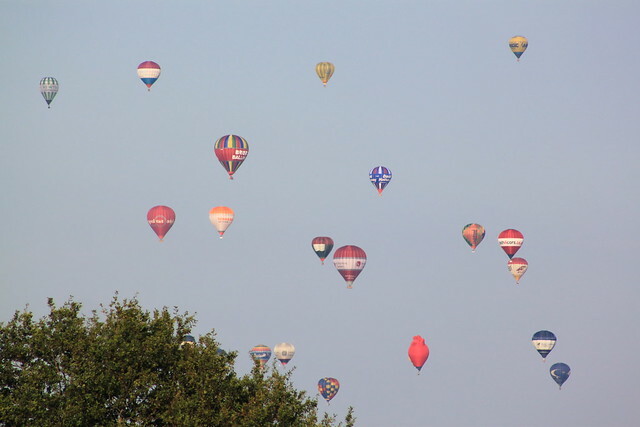 It was fantastic to stand and watch the different balloons glide serenely overhead. And it was a particular fluke that most of them seemed to pass directly over our garden. 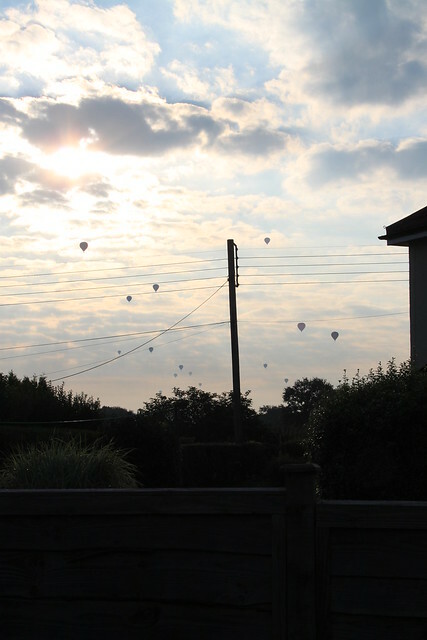 This is my favourite photo, which I took as one of the balloons was just coming up over the house. This is my second favourite photo. I wish the sky was always this blue. 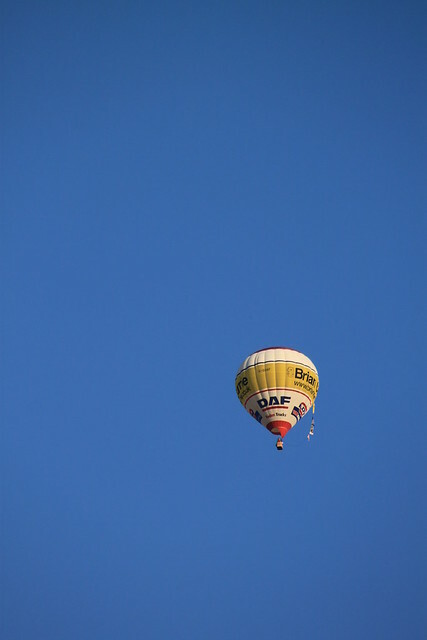 Some of the balloons were quite a bit lower, though, so we could wave at the people dangling out of the baskets. A few of them were particularly enthusiastic. Molly was also quite enthusiastic. We’ve tried hard to socialise her to the sorts of things that she’s likely to come across, but I have to admit that low-flying hot air balloons full of screaming, waving people was not on our list. 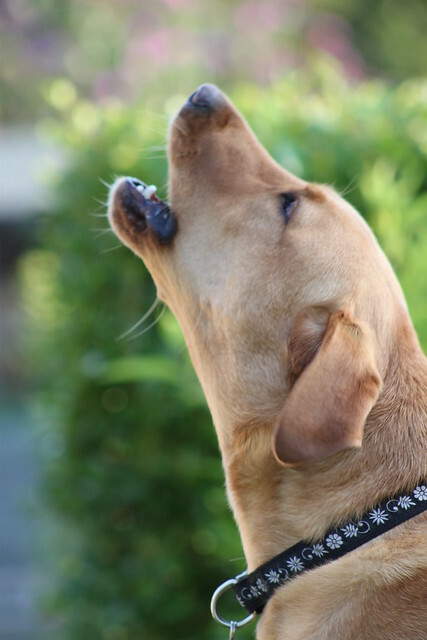 Once she’d got the obligatory initial bout of woofing out of the way, though, she seemed to take it in her stride. And then, as quickly and as silently as they had arrived, the balloons were gone. * I’ll spare you the photos of me wandering around in a dazed fashion wearing only my Canon DSLR and a pair of pyjamas, because there’s already enough filth on the internet and I have no desire to add to it. This entry was posted in Dogs, Home, Photography, Travel and tagged Balloon Fiesta, Balloons, Bristol, Dogs, Home, Photography, Travel by Simon Perks. Bookmark the permalink.